Cross Rhythms last spoke to Simon Brading back in 2007 shortly after the release of his debut mini-album 'Going Your Way' when he was a fresh-faced worship leader whose talents had come to light through the newly established New Frontiers-run Newday annual youth events. Some 11 years later, the Brighton-based worship songwriter has finally recorded and released his first full album and, whilst a gap of over a decade would seem like an inordinate amount of time between releases, it's certainly been worth the wait. Garnering a raft of positive reviews, the refreshingly experimental and non-conventional 'Alive With Worship' is a stunningly inventive piece of work that goes beyond the limits of the modern worship scene and redefines what it means to worship God through music. 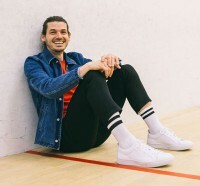 Produced by Jack Wintermeyer and co-written with a number of songwriting partners, 'Alive With Worship' also highlights Brading's collaborative and inclusive approach to making worship music - an approach that is reflected in a number of music ministry roles he has taken on in the intervening years since his debut offering. Since 2008, Brading has been the worship pastor at Emmanuel Brighton - a multisite church with four campuses within the Brighton and Hove area boasting no less than 25 worship leaders - and has helped develop church musicians in their respective positions whilst seeking to nurture a vibrant culture that seeks to redeem different kinds of music for the glory of God. In addition, Brading continues to oversee the worship at the Newday festivals which has resulted in fresh praise material being introduced to over 7000 youngsters each year (and subsequently released on various Newday live albums) whilst his passion to train others in the field of worship has seen him establish the annual one day national conference Worship School UK. I catch up with Simon the day after his return home from a well-deserved family holiday in Spain to ask him if he was pleased with the reaction to 'Alive With Worship'. "I'm very encouraged with the response to the new album," he confirms. "The songs have really been connecting locally here in Brighton and at Newday and it's exciting to put them on a studio project to push them a little further and wider." Whilst established Brading songs like "Rock Of Ages" and the album's title track will be familiar to the thousands who have attended Newday festivals over the years, it appears that there is plenty of scope for the songs on the 'Alive With Worship' to reach a wider audience. "We're aware that there are lots of people who've never been to Newday and are therefore unaware of the songs," Simon suggests. "We've been working with those songs in our local church network for a few years now but we wanted to push them a bit further. Local youth groups have been singing them and some local worship leaders who have been to Newday have taken them home to their own churches. It's so encouraging when you hear of churches connecting with a certain song and it's a real blessing to hear that that's happening." I suggest that 'Alive With Worship' seems to have an identity of its own compared to the sometimes generic feel of many modern worship albums and I ask Simon if it was a deliberate move on his part to offer up something that had a unique feel to it. 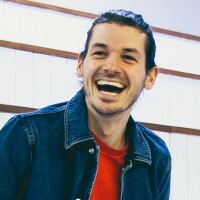 "Part of our vision here at Emmanuel Brighton is redeeming culture for Christ," explains Simon. "In Colossians, it talks about Christ reconciling all things to himself and what that means for us as a worship team is that we need to realise that every kind of music belongs to Jesus. It's not like so-called worship music is his and any other kind of music belongs to Satan. It's not like that at all - all of the sounds, textures and timbres that we as human beings make are ultimately for the glory of Christ whether the people making those sounds know it or not. We want to get deep into culture and restore and bring back what belongs to Jesus and redeem it for Christ's glory. "I guess worship music has become its own genre but I've got a growing conviction that this is not right as God should be worshipped through lots of different styles of music and genres," continues Simon. "Brighton is a very musical city and we feel we have been called to reach its musicians and bring them into a church environment where they feel the music they're hearing is native and makes them feel at home - not something that's come from America or somewhere else. When we decided to record 'Alive With Worship', I very much wanted to keep it in line with the conviction we have at our church that what Christians identify as worship music isn't the only kind of music to worship God by. I wanted to record an album that you could really enjoy listening to as well as one that would feed you spiritually." Part of the success of 'Alive With Worship' lies with Simon's choice of producer and I ask him what Jack Wintermeyer brought to the table. "It's easier to tell you what Jack didn't bring to the table," he laughs. "Take a song like 'The Cross Of Christ', for example - he really got inside the pain of the events at Gethsemane and came up with a range of discordant sounds to reflect what the song was really about. What Jack brings to any project is a whole palette of sounds and a really fresh understanding of the kind of music that's out there today. He also has a great ear from melody and counter-melody and comes up with some beautiful guitar lines on the album too. "Jack brings a slightly darker side to my music," Simon confesses. "When you think of the Beatles, McCartney was always generally a bright positive writer and perhaps on his own he could sometimes go too far that way whilst Lennon's songs had a darker quality and, when you put the two of them together, it brought out the best in both of them. That's kind of how Jack and I work. If it was left to me, everything would be in a major key and it would be all happy go lucky whereas Jack brings out a broodier aspect to my work which is good. In many ways, Jack had a difficult job because some of the songs already had very defined arrangements through their exposure at Newday. He quite rightly suggested we try something different on those songs so that, on the album, they wouldn't sound like they were merely studio versions of songs taken from a Newday live release. Those songs might feel different to how they have sounded before but I've come to love the new arrangements on the album." On an album where every track is a highlight, a few songs in particular stand out for Simon. "I really enjoyed doing 'Gracious'," he explains. "It was a really personal song for me and I wanted the lyrics to connect with the feeling of shame, failure and pain. 'Breakthrough' is a song about the unlimited power of God to do anything. We'd been using that song at Newday for the last few years but something special happened when we recorded it for the album and it felt amazing. Another song that's special to me is 'Hallowed Be Your Name' which I co-wrote with my wife Anna. Anna has grown hugely as a songwriter and a worship leader over the last few years and we've co-written a few of the songs on the album which has been great. We lead worship together at Newday and Emmanuel and she's a major part of the journey. Anna has helped me as a leader and a writer and I'm so grateful for that. We sing 'Hallowed Be Your Name' together on the album and it's the one that's connected the most outside of Newday and Emmanuel - quite a few churches have picked up on it which is amazing." As well as being a sonically impressive piece of work, 'Alive With Worship' is crammed full of well-crafted lyrics that reach deep into the soul whilst telling of God's splendour and majesty. "I believe that worship songs should contain depth and should teach us the gospel," Simon advises. "If you think about Charles Wesley - he wasn't just a good poet, he taught people about Christ through his songs. In Colossians 3:16, that is the commandment to us all - 'let the message of Christ dwell among you richly as you teach and admonish one another with all wisdom through psalms, hymns, and songs from the spirit.' That instruction means we need to look at the songs we're currently singing in church and ask ourselves if we're singing songs that teach us about salvation through Christ or not. "With Wesley right up to about 30 or 40 years ago, we were singing through salvation and it seems that nowadays we're singing more about our encounter with God," Simon expands. "In one sense, I understand the sentiment about singing about our encounter with God - we all want to experience him - but the way to get there isn't just by singing about it. It is harder to write songs of depth because it takes thought, study, reading books, reading the Bible and walking with God. To write about theological matters and get the salvation message across in an accessible and palatable way with a good musical hook is tricky but surely that should be the goal of every Christian songwriter. I can't live with the thought that the best songs from this island came out 200 years ago - I believe God's got more for us. I feel very committed to writing modern day lyrics of depth to a backdrop of good music and hopefully that's something we've gone some way towards achieving with the new album." In addition to his role as worship pastor at Emmanuel Brighton, Simon also finds time to run Worship School UK. "In its current format, it is an annual one day conference that we do every June," he explains. "We have about 500 people who come along and it's primarily for worship leaders and musicians but it's also open to anyone who just wants to grow in worship. My heart is to have an army of worship leaders and bands across the UK who love Jesus, are full of the Gospel and are redeeming culture for God's glory." I suggest that his involvement in the Newday youth festivals, Worship School UK and Emmanuel Brighton must have a positive effect on his own songwriting and worship leading. "Newday has really pushed us forward as a team," he confirms. "When you know you've got to be a house band for 7000 people for a week, you want to bring your absolute A game to it - especially since we record a live album at Newday every year. You really need to get your act together and get the best possible arrangements for the songs and that definitely helps you develop as a musician or a worship leader." Simon is refreshingly willing to take the odd artistic chance or two in the live arena. I ask how the 2016 live EP 'Alive With Strings' came about. "One year for one night only at Newday, we did a worship night with a string section - something we'd piloted previously at Emmanuel," he clarifies. "Doing a big string night at a youth festival sounds like a crazy idea but we gathered every grade eight string player we could find at the festival and got them to play some arrangements that composer Stu Kennedy had written. What followed that night was just simply an awesome night of worship. After we'd finished and as we were getting off the stage, we could see that people were in tears due to it being a really moving time of praise. We put what we'd done that night out on a live EP - completely live from that evening. In fact, we decided to put the live with strings version of 'I Worship You' from that session at the end of the 'Alive With Worship' album knowing that we'd never get a better version." The 'Alive With Strings' EP aside, I point out that 12 years between the release of 'Going Your Way' and 'Alive With Worship' does seem like quite a long time. "I think the plan was always to do a full album after I released 'Going Your Way' in 2006 but it just wasn't the right time for a whole bunch of reasons," Simon admits. "God has done a lot of things behind the scenes with us as a team and me personally which meant that it just wasn't right to release a full album until now. What God has done since that first release is develop a whole team of songwriters and half of the songs on the new album are co-writes with other people. That's what's been happening over the last four or five years at Newday and we've now got a group of very strong lyric writers, songwriters and producers. "It's very exciting to think what we could be doing as a team going forward," adds Simon in closing. "Watch this space!"